The main bedroom is a beautiful light and spacious room with a luxurious double bed. It has a well appointed modern en- suite bathroom. A doorway leads through to the kitchen, balcony and sitting room. From your private access through the rear garden gate, you cross the cottage garden to a large decked area and step up to your own front door. Here you enter into the charming and characterful living room - a lovely place to relax and watch television after your day exploring the Surrey Hills. The living room leads into the kitchen and private balcony as well as the main bedroom, en suite bathroom and second double bedroom. For families the large comfy sofa converts into a sumptuous double bed. 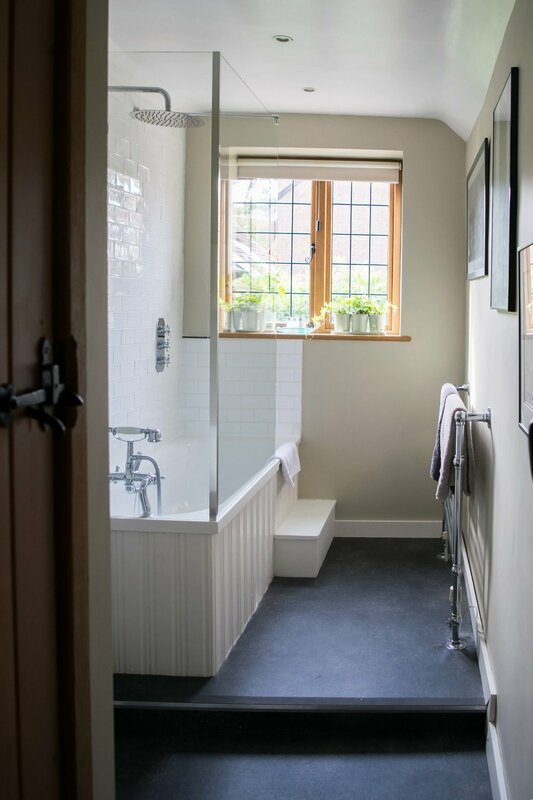 A beautifully designed modern and spacious bathroom with bath and shower facilities. It looks out onto the private balcony and cottage garden. Linking the main bedroom and living room is your own well equipped kitchen. Its french doors open out onto a secluded private balcony with table and chairs, over looking the cottage garden. Our guests love this unusual feature as it offers flexibility for eating in or out, a feature not generally found in B & B accommodation. Our kitchen includes a microwave, fridge, toaster, kettle, cafetiere and enough crockery, glasses and cutlery for 6 people. Tea, coffee, hot chocolate, fresh milk, sugar and biscuits are all provided. Up a couple of stairs and round the corner is the second bedroom furnished with an amazingly comfortable double sofa bed. This lovely dual aspect light room overlooks the garden to the South and the village to the West. Vaughans is unique in that it offers our guests outside spaces - private and for your own enjoyment. Off the kitchen is the secluded balcony with views over the cottage garden. South facing this is a great place to eat breakfast, catch the rays, or to sip a gin & tonic on a warm summer evening. Outside your front door and leading from the sitting room is a large decked area with ornamental table and chairs for your use to sit and admire the cottage garden. We have outside space and water supply for hosing down your mountain bikes after trail riding the Surrey Hills.